I enjoy how this episode is very much a Zenigata episode, but also very much more a Lupin episode. Or rather, "Lupin's relationship with Zenigata" episode. Zenigata episodes are usually just about him as a person, but with him suffering an identity crisis, a lot of this is how Lupin reactions, with a bit of Zenigata's new persona. The setting seems to be a small-to-medium sized town in Russia, which is a change of pace, as most of Part V takes place in France, and there's not a whole lot of Russia in the franchise, even if you count that early TV special. 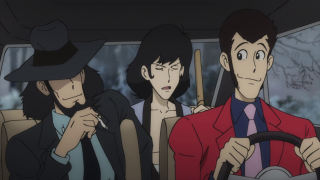 There was an excellent Jigen episode that started in Putinland (back when it was Kosyginland), but it's still rare to find a lot of Russian settings in Lupin III anime. I like the change up here, because the snowy setting, the slight change of clothes, the new foreignness of it mixed with the new Zenigata persona sets a good back drop for the plot. The One-Winged Venus seems to be based on the Winged Victory of Samothrace, a marble sculpture of Nike on display in the Louvre in France, though this sculpture still has its head. The Tears of the Romanovs seem to just be basically your generic big ol' jewels people presume the Romanov Dynasty had, though not based on any particular existing ones. 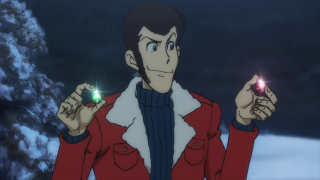 The amusing thing is that they're red (jacket) and green (jacket). 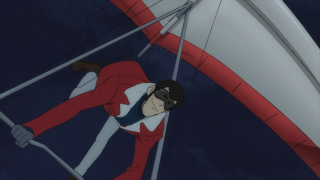 I was amused that instead of taking sympathy in Zenigata's plight, Lupin was more affected by his constant one-upmanship during the attempted heists. 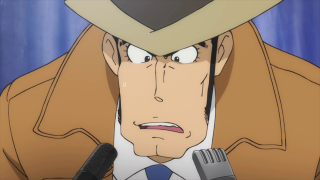 Zenigata, knowing how Lupin's mind works, internalized those methods as a cop and now as a thief is using them, even though he doesn't know who he really is. This, naturally, is a wound to Lupin's pride. While he may have originally returned to town because he hadn't seen Pops since the last time he was there, now it was his reputation he was concerned with. 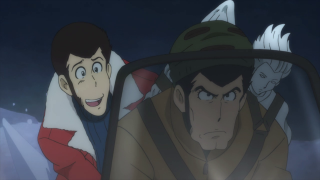 At least toward the end, Lupin was happy that Zenigata felt fulfilled in his new career, even though it was fleeting and the status quo has been resumed. 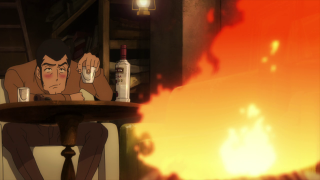 Lupin, he's a nice man. This episode wasn't quite as good as the previous two, but was worth a watch nevertheless.